Super-Absorbable Coq10 Ubiquinone with d-Limonene is a potent antioxidant supplement for normal cardiovascular support. Super-Absorbable CoQ10 Ubiquinone with d-Limonene is recommended for people supporting normal mitochondrial function. Life Extension Super-Absorbable CoQ10 with d-Limonene provides the ubiquinone form of CoQ10 in a super-emulsified formulation supporting normal cardiovascular function. CoQ10 is required to convert fats and sugars into cellular energy, yet the natural production of CoQ10 declines with advancing age. CoQ10 is also a potent antioxidant, helping protect the proteins, lipids and DNA of mitochondria from oxidation, and supporting mitochondrial function. d-Limonene is a natural compound in orange oil that disperses and breaks down the CoQ10 particles, which reduces their size and makes CoQ10 more absorbable by the body. As a dietary supplement, take one (1) softgel daily with food, or as recommended by a healthcare practitioner. Super-Absorbable CoQ10 Ubiquinone with d-Limonene product is available only from licensed healthcare professionals. 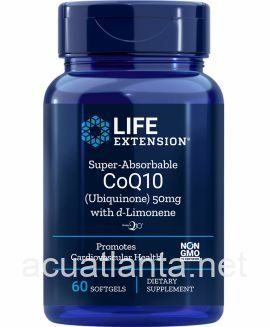 Buy Super-Absorbable CoQ10 Ubiquinone with d-Limonene Online here at AcuAtlanta.net or our clinic.